Knightmon + Win Ratio 60%! Silphymon + Win Ratio 60%! Andromon + Win Ratio 60%! The high-speed rotation of his spear, Claíomh Solais, pulverizes all data! Has the power of "gale" and "chivalry." Option cards have no effect. 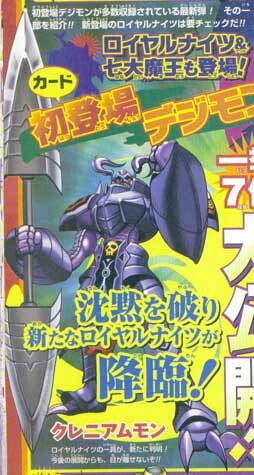 Discard two Digimon cards from your hand to double Craniummon's attack.